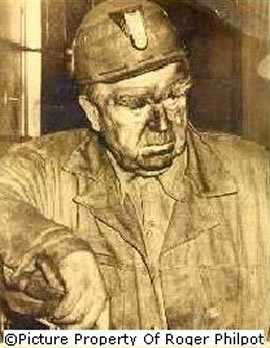 John L. Lewis, the "Miner’s Hero," in 1951. Photo Courtesy of Roger Philpot. John L. Lewis served as president of the United Mine Workers of America (UMWA) from 1920 to 1960. In addition to fighting for better wages, working conditions, and health care for the nation’s miners, he also worked to organize American industrial unions into a unified federation–the Congress of Industrial Organizations (CIO). Lewis never wavered in his dedication to improve the lives of America’s coal miners, even if his actions were sometimes very unpopular. For example, in 1943 Lewis led half-a-million coal miners in a strike for better wages. Because coal is used in the steel-making process, the strike shut down the steel industry for two weeks at the height of the war. Lewis was widely condemned as being un-American and the labor movement lost valuable support. Perhaps Lewis’ greatest achievement was securing better medical care for coal miners. Under Lewis’ leadership, the government forged an agreement with the UMWA that resulted in the building of eight hospitals and numerous clinics in coal mining regions. These facilities served the medical needs of coal miners, many of whom suffered from black-lung disease. In 1964, President Lyndon Johnson awarded John L. Lewis the Presidential Medal of Freedom, the highest civilian honor an American citizen can receive. Lewis died in 1969. To see UMWA workers gathered at a 1998 demonstration, click on pictures below.